I’ve been doing a lot of interviews with DJs and producers lately and I also publish a weekly podcast by a local DJ. This means I get to speak to a lot of electronic music artists. Most of them don’t impress me as much with their back story as Noir did though. I have a weak spot for people who confidently set out to realise their dreams, and make it all the way. DJing, producing, running a label.. Noir had his future planned out for himself from the very beginning. Who is Noir, where did he come from and what doe she sound like? Do you still live in Denmark? How is the house and techno scene there, is it lively? At the very beginning, I bought the domain noir-music.com. I knew that when my name was big enough I would start up a label with the same name. You’re coming to Amsterdam next weekend to perform at STRAF_WERK. Our city is quite small, much like the big towns in Denmark, but the techno and house scene is doing quite well here. You’ve had a few gigs here before if I’m not mistaken. Do you remember them well? Which clubs did you perform at during your previous gigs in Holland and when were they? 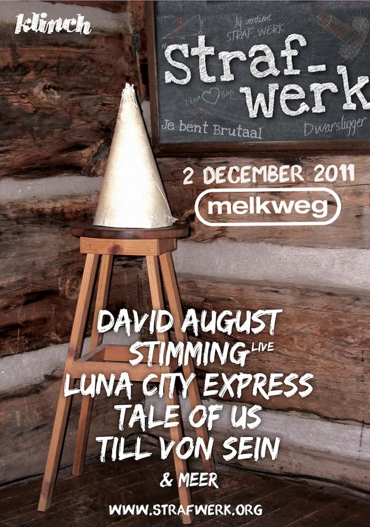 At Strafwerk, you’re playing alongside guys like Tale of Us, Luna City Express, David August, Stimming and the list goes on. Anyone in particular you yourself are looking forward to seeing? You’re known and successful as a DJ, producer and label boss for Noir music. Which of these occupations do you see as your first? What are your plans for the future as a DJ, producer and label boss? Who’s your favourite artist/biggest inspiration right now? Can you reveal one track that will very likely be in your DJ set on Friday? Going to STRAF_WERK on Friday? Catch Noir from 23:00 ’till 00:30 at the Melkweg.